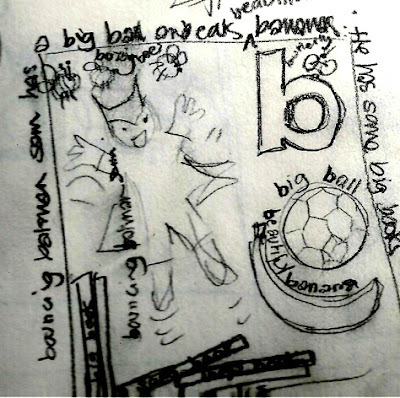 ABC for Lucy, illustrated book, Rough initial page layout - subject to many changes! I've been managing small amounts of time for more 'serious' painting - but the little bits of time here and there, while busy with other things, I've been working on ideas for a book for Lucy who will be one at Christmas. I thought I'd make it a little dual purpose and appeal to Sam (age 4) as well as he'll be learning to read any time soon. Drawn in an A4 sketchpad, several of these to a page, done leaning on the steering wheel of the car while waiting when I was taxi for family to various appointments, so they are very rough and merely getting down thoughts and ideas of how it will go. 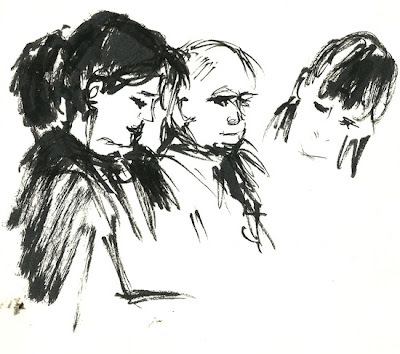 Very quick sketches of fidgeting, moving people in a waiting room. Not great, but better than being bored :>) and good practice. 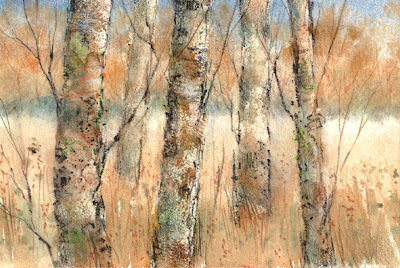 Autumn, watercolour and mixed media, 8.5 x 5 ins approx Looking from the field's edge, across the stubble left after the wheat was harvested, towards the far trees. This was done in watercolour, with the addition of watercolour pencil drawn and scratched into wet washes and a little biro (ballpoint pen). Nearly finished but I'll probably keep tweaking it for a bit! The earlier stages are here and here and other trees are here. ... and one that just didn't work - using coloured pencils on a mid brownish pastel paper. Not a mix to repeat, for me anyway. The colours are too dulled by the paper, the pencils simply didn't have the intensity to cover it. I've got a small piece of Fisher 400 to experiment with - a friend, Nicole Caulfield, uses it for all her portraits and loves it. I think I have to give it a go with watercolour and coloured pencils together. I had thought that this sketch kit - my most minimal unless I simply take a mechanical pencil plus the tiny sketchbook - was small. The tiny sketchbook is an old diary, with a cover to pretty to throw away, refilled with heavy cartridge paper in a concertina fold.. It fits into the pencil case. I don't actually like working that small but sometimes it's all I am able to carry and at least I have it with me. Often I'll take the pencil case plus bigger sketchbook. 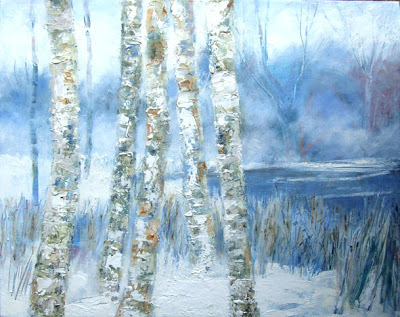 I'm hoping to continue with the birches today - life has been hectic with no daylight painting hours.